During the Olympic summer of 1996 I happened to catch Mad Margritt for the first time at the Atlanta club, the Masquerade. I was thereto see the Kiss tribute band, Strutter, and Mad Margritt happened to be the opening band. As Mad Margritt started playing, I didn't know what to think. A band in the vein of the heavy metal hair bands of the 80's. But, as I listened, I was transported back to high school, when rock and roll was FUN, before Metallica and Nirvana tried to make rock too serious (and in the process almost ruined it!). They may not be the flavor-of-the-month on the "alternative" rock station, but they ROCK more than 99% of these new bands. I'm talking a total blitzkrieg musical assault of melodic intensity. I was so impressed with their music that the next day I bought a copy of their demo CD, "Cold Sweat." At the time I thought, "Mad Margritt may not be the future of rock and roll, but they sure make it FUN." Fast forward to May of 1999. I'm flipping through the pages of the Atlanta music mag and see an ad for a Mad Margritt CD release gig the following night. These guys are still at it and got signed! I called and they graciously agreed to an interview before the show...Talking to members of Mad Margritt, one thing became very clear. They are about as down to earth and un-pretentious as you can get! No offstage antics or inflated egos. Their music is what is important. I finally got to listen to their new CD, "In the Name of Rock". The title track is one of my favorite songs of the year. Just when you thought all the good rock anthem songs were written...along comes Mad Margritt with "In the Name of Rock" to hit you from the grassy knoll. That's the attraction of Mad Margritt...they let their music do the talking. E.C. : O.K. 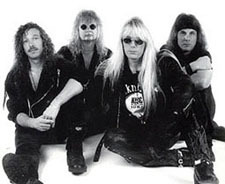 the band started in 1990, tell me about the origins of Mad Margritt? E.C. : What does the name Mad Margritt mean and who came up with it? Mad Margritt: (all laugh) This is a funny story...actually the band that weleft to start this band, the singer from that band had kind of an egoproblem. And we used to nickname him, "mad margritt" behind his back.We'd go to pick him up for a gig, he'd be coming out of his house with a pissed off look on his face. And we'd go, "oh great, here comes mad margritt!". E.C. : On your web page it mentions the band staying true to their roots.What does that mean to you? Mad Margritt: It was real important for us not to follow the trend...whatever the current bandwagon is to jump on. E.C. : Who does the songwriting? Mad Margritt: Its really different each song the way it comes together, sometimes anindividual will write the song. I [Eddie] write all the lyrics. Sometimes the music just comes together jamming at practice. E.C. : Your new CD, "In the Name of Rock"...how do you compare it to "Cold Sweat"? Mad Margritt: This is our first release on Delinquent. We only pressed 1000 of"Cold Sweat". So actually some of the songs on "Cold Sweat" they wantedto put on the new CD. We didn't stray too far from that style of writing. Maybe a little more edgier, the new stuff. E.C. : Since MTV has nothing to do with actual music anymore, and radio stations are pimps for alternative music, how do you classify your band? Heavy metal? Mad Margritt: No, I would just say high energy hard rock. E.C. : What do you feel is the future of that type of music? Mad Margritt: Right now, its definitely an underground thing...far from being the mainstream. That's where everything starts, in the undergroud. If you can get a buzz going, like the Seattle scene or the punk scene. That's what we're hoping for. We're just gonna keep doing what we do and enjoy doing it. E.C. : So, you concentrate on the live shows? Mad Margritt: That's what we live for, everything else is just a vehicle to get on stage and play. E.C. : What are the band's hopes, now that you are signed to Delinquent Records? Mad Margritt: Ideally, what we would like to do is get out on the road now. It looks that is gonna happen this summer. If we can sell enough copies through Delinquent, then it would hopefully catch somebody biggers attention. E.C. : What part should image play in rock and roll today? Mad Margritt: The way we look at it...probably our image right now works agains't us in 1999. We've gotta play the music that comes from our heart, if people don't like it they can turn around and walk out the door. E.C. : I've got one finally question...do your amps go to 11? Mad Margritt: Ours go to twelve (everyone laughs)!